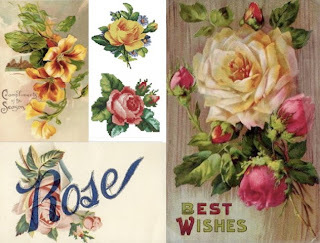 "Lately I am completely taken with vintage greeting cards depicting roses in the quirkiest shades of pink, yellow, coral and blue. So taken that I am busy growing a new collection with needle and thread. Stay tuned for Dreamy With a Capital D..."
I love the rich vintage colour of these roses. Will have to take a look at her work. Hola, so nice meeting a bussy and creative woman like you... your blog is really inspirig and I think I will have to come back many times to read and enjoy all your posts!! So sad Real Living magazine is not available here in Chile, but the online option is pretty good though.